Bike-in Cinema kicks off with a journey over road, rail and sea. Exploring the wonders of unfamiliar places and discovering tales from the path less travelled, The Open Road takes viewers across Canada, the USA and all the way to Ireland through a collection of short films and animation! CAMPER (Contemporary Art Mobile Public Exhibition Rig) is one of TRUCK Gallery’s regular public programs. Utilizing a 1975 Dodge Empress motor home, the CAMPER has been modified to become a portable public exhibition and project space. CAMPER’s mandate is to investigate the places where art, the road, education and recreation meet, and to explore these intersections in an inclusive, participation-based manner. 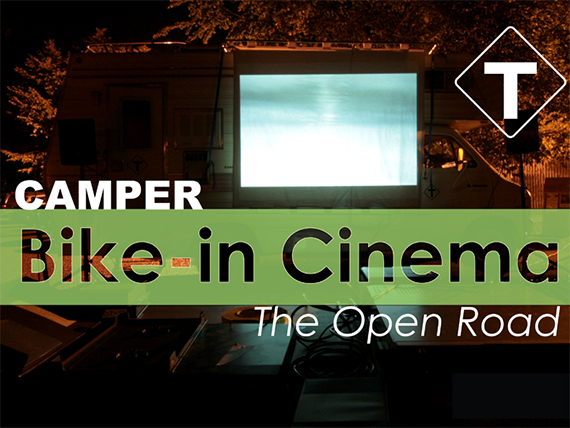 Currently CAMPER is host to Bike-in Cinema, an outdoor screening series presented by TRUCK in partnership with some of Calgary’s finest film, production and new media organizations. Using the CAMPER as a site for projection, Bike-in Cinema is a collaborative celebration of film, animation and media that encourages exploration of Calgary’s urban environment. Set in the various locations of the Calgary outdoors, Bike-in Cinema invites all to cycle towards the CAMPER for a night full of animation and film!